In today’s collaborative modern workplace, many companies still find themselves operating in walled-off silos between sales, marketing, customer service, and accounting departments. These teams are unable to communicate effectively about the shared company business contacts amongst themselves, allowing for missed opportunities and dropped balls. 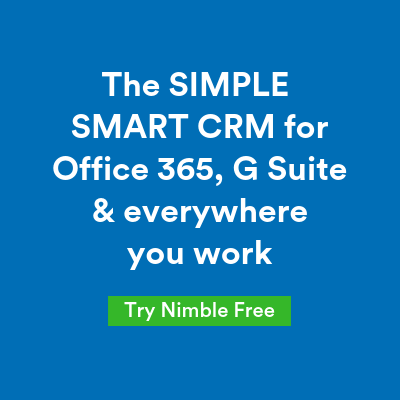 In today’s update, Nimble has embedded the ability to synchronize over 160 Nimble’s of the most popular cloud business applications in the sales, marketing, customer service, and accounting categories by streamlining our built-in PieSync integration; empowering users to bring all of their company’s disparate contacts into a single team relationship manager. This enables your team to engage more intelligently by accessing a shared 360-degree view of contacts enriched with company and personal insights, social signals, communication histories, and more. This two-way synchronization works back inside wherever you work, delivering contact and company insights within your favorite business apps and wherever your team is prospecting on the web. This is the first of many new features as part of our Nimble 5.0 release slated for later this year. Watch the 2019 Roadmap Vision webinar here. One of the first steps to a successful start in Nimble is uploading your company contacts. Choose from over 150 networks — from an existing CRM, spreadsheets, social and email accounts, third-party integrations, and more. 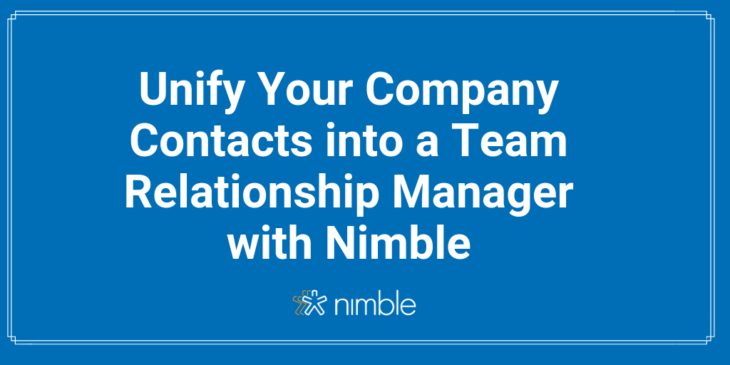 Once you add your contacts to Nimble, you’ll be able to take advantage of automatically enriched contact cards complete with social and business insights; including company details, communication histories, social interactions, notes, and calendar events. 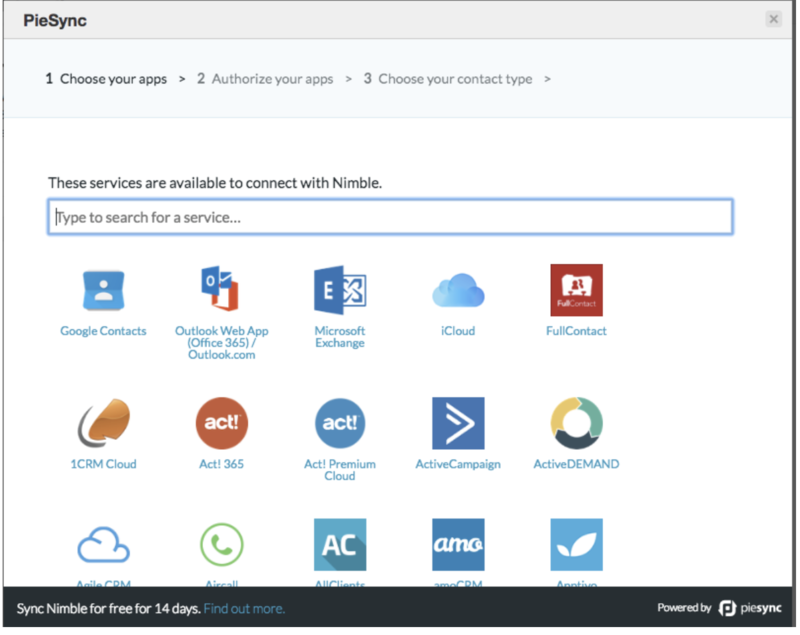 Nimble integrates with over 160 cloud-based business applications. Thanks to Piesync, Nimble users can integrate two-way syncing functionality with their CRM. Existing Nimble customers get unlimited contact syncs through Piesync for two weeks. If a Piesync account has already been activated under the Nimble-related email address, the user can sync up to 2,000 contacts (per license, per month). This will enable teams to build better relationships with their existing contacts and prospects. You can choose to sync all of your contacts or select a subset of them (based on tags), one-way or bi-directionally. PieSync also checks every five minutes to see if something changed in the contacts you chose to sync, such as updated email addresses or phone numbers. 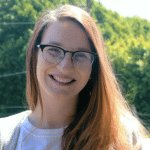 Many business teams use MailChimp to send out their marketing outreach to various distribution lists. These lists hold valuable lead and prospect information that may not be used to their full potential when locked inside one app. Piesync allows teams to unlock the potential of siloed contact lists by importing them into Nimble for further enrichment. After importing contacts into Nimble, connect with leads across social platforms to begin cultivating better relationships built on mutual interests and commonalities. You can also create smarter segments within Nimble (based on industry, lead type, etc.) for highly targeted group messaging complete with tracking analytics. This optimized outreach will increase engagement rates, click-throughs, and open rates. Unlock the goldmine of referrals and repeat business opportunities in your accounting programs such as Quickbooks and Xero by syncing the contacts you’ve sold to in the past into Nimble CRM. Once synced with Nimble, these contacts can be leveraged to their full potential by accessing new company and personal insights that enable your team to engage more effectively. These are just a few of the many apps you can import your contacts into Nimble via the Piesync integration. For more information on unifying your contacts, click here. Learn how to get started on our FAQ page. Our Piesync integration is one of the many benefits available for all Nimble users! If you do not have a Nimble account yet, we invite you to try it for free for 14 days. Stay tuned for more product announcements as we evolve Nimble into the best CRM for Office 365 and G Suite teams. Listen to a video from our Nimble CEO Jon Ferrara as he shares more about our 2019 Roadmap Vision.